Brooklyn raised singer, songwriter, and multi-instrumentalist, Shareef Keyes, unites a collective sound of funk, hip-hop, and alternative R&B with the help of a twelve-piece band of New York City’s finest young artists hailing from Juilliard, The New School, and Berklee College of Music, ultimately creating Shareef Keyes & The Groove. Inspired by Parliament-Funkadelic, James Brown, and Wu-Tang, Keyes & The Groove have played memorable performances for crowds at Harlem Arts Festival, Pianos, Bowery Electric, Public Factory, Bronx Museum of the Arts, and Webster Hall. Last year, the 25-year-old creative notably opened for jazz-funk pioneer Roy Ayers in front of a sold-out crowd at Brooklyn’s BRIC House. 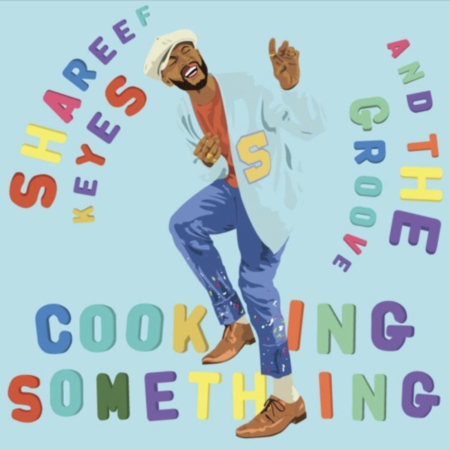 Today, Keyes & The Groove are thrilled to reveal the next chapter of their discography with new LP, Cooking Something. A project four-years in the making, the album is curated by Keyes and his older brother, Glo’. Cooking Something hones in on the band’s distinctive sound of fusing 70s jazz-funk influences with a modern hip-hop undertone. A cohesive project from beginning to end, the LP holds a savory catalog of tracks like, “Potato Salad,” “Macaroni and Cheese,” “Cornbread,” and the legendary Ghostface Killah of Wu-Tang lends some bars on cut LP “Spaghetti Fettuccine.’ Providing a sonic palette to accompany the album’s title, as well as a number of Keyes orchestrated segues, the project proves a masterful fusion of nostalgia inducing throwback sounds and modern influences that jazz heads, hip-hop enthusiasts, and R&B experts alike will find solace in.